When the state offers unions a seat at the table, it can make their members politically passive. Is the trade-off worth it? 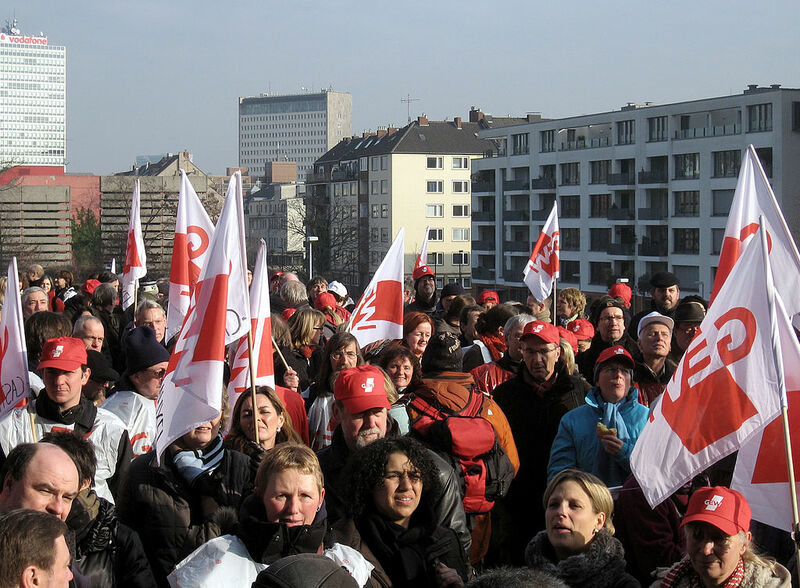 A trade union demonstration in Düsseldorf, Germany. Mbdortmund / Wikimedia. Most conventional scholarship on labor unions concentrates on their effects on the distribution of economic resources. It typically finds a positive correlation: collective bargaining raises worker pay, as it’s designed to do. But focusing on wages alone doesn’t give us the whole picture. In order to understand unions’ impact on working people’s power as a class, and therefore their prospects for resisting capitalist class power broadly speaking, we need to examine the effects of different kinds of union arrangements on workers’ political participation. What kinds of unions encourage what kinds of political behavior, and to what degree? We also need to understand how likely that worker political participation is to make a significant impact on society, which means we need to look at the national political contexts in which different kinds of unions operate. For example, some types of unions better encourage strikes and protests, but some states repress that political activity more than others. Only by comparing unions’ effect on political participation across political systems can we begin to comprehend unions’ potential for working class empowerment, and under what circumstances. A new paper by sociologists Jasmine Kerrissey and Evan Schofer provides data that can help us get at these questions, and draw specific lessons for American unions in the process. Kerrissey and Schofer draw a distinction between organizational factors and institutional factors. The former refer to the structural nature of a given organization — like a church or a school or, of course, a union. How is it ordered and arranged, and what is the impact of that structure on individual behavior? For example, Germany had a high degree of corporatism in the late twentieth century — and still does compared to other nations, though the official clout of unions is wearing thin as neoliberalism continues to undermine labor. This means that in Germany, unions are recognized as legitimate actors by the state and are encouraged to bargain at a very high level with employers’ associations. With state sanction, conflict between employers and employees is managed professionally by top union officials, who agree to minimize strikes and preserve labor peace in exchange for a seat at the table. The outcome is that unions in countries like Germany have a lot of power to raise pay and benefits for large numbers of workers at once. But, on the flip-side, they tend to neglect the kinds of political activities required to prepare workers for strikes. The United States, by contrast, had a low level of corporatism in the twentieth century, and it appears to be sinking lower yet. Unlike in Germany, the American state doesn’t regard unions as crucial peacekeepers or strike deterrents, or afford them a corresponding degree of official recognition. In fact, the US state regularly engages in union suppression, as was clearly demonstrated in the recent Janus v. AFSCME Supreme Court ruling. The result is the opposite of Germany’s: unions in America don’t have as much muscle to wring concessions from employers for thousands or even millions of workers at a time. But that pushes American unions — when they’re not asleep at the wheel — to rely more on things like strikes, protests and voting, which means they have to do things like build political consensus among workers, teach them organizing skills, secure buy-in with democratic processes, and mobilize workers around key elections and issues. Across the board, whether in a country like Germany or the US, being a member of a union makes a person much more likely than non-members to engage in these kinds of activities. In an analysis of sixty countries worldwide, Kerrissey and Schofer found that union members were more than twice as likely as non-members to participate in a demonstration, occupy a building or factory, and go on strike. Union members were between 1.5 and two times as likely as non-members to boycott, sign a petition, and participate in political discussions. And the real kicker: union members are three times as likely as non-members to volunteer for a political party. However, organizational factors matter a great deal. The researchers found that corporatism, as seen in Germany, “appears to substantially dampen the political participation of union members. This is obviously the case for strikes, which corporatist arrangements purposefully diffuse. However, we find that almost all forms of participation are reduced in corporatist settings.” That is, individual union members in places like the United States that have a low level of corporatism are more likely to be politically active. Kerrissey and Schofer make a second distinction, which is important for understanding the implications of the first: different political systems. They look at political participation by union members not only across organizational differences but also institutional differences — that is, the degree of democracy in a given country. Some corporatist countries, like Germany, have comparatively high levels of democracy, which they define as open, competitive elections, protections for civil and political rights, and so on. But there are other corporatist countries, like Egypt, which give unions a formal seat at the table yet lack features of democracy like fair elections and free speech protections. Kerrissey and Schofer distinguish between “neo-corporatist” (high corporatization, high democracy) countries like Germany and “state corporatist” (high corporatization, low democracy) countries like Egypt. In the latter, unions are not independent of the state — their “seat at the table” is formalized to the extent that they are functionaries of the regime. In Egypt, where regime-embedded union leaders have failed to push for concessions that benefit workers, this has caused some union members to participate in unsanctioned political activity. While that activity is met with swiftly and aggressive repression, it continues to occur, especially as the Egyptian state proceeds to suppress workers’ wages with the tacit participation of union leaders. The researchers note that the neoliberal breakdown of corporatism in Germany in the early twenty-first century has also led to an uptick in unsanctioned political activity. The difference is that in Egypt, with its low level of democracy, workers who occupy factories or protest in the streets face a greater possibility of arrest and violence. Because Chile under Pinochet lacked democratic institutions, workers were less likely than their American counterparts to engage in certain kinds of political activity, such as mobilizing in elections. Instead they engaged in more “furtive” activities like “brief wildcat strikes and industrial sabotage,” which were met with state repression, as in Egypt. While political activity of union members in Chile under Pinochet was indeed creative, and vitally important to anti-authoritarian resistance, the example demonstrates that non-corporatism is not sufficient by itself to ensure that such activity is able to effectively build class power against pro-capitalist forces. A country’s degree of democracy is a decisive factor. Reviewing these examples, it might seem as if unions in the US are in a pretty good position to build class power by encouraging and cultivating workers’ political participation. But the downside of a non-corporatist model is that the state actively seeks to undercut unions, diminishing collective bargaining rights and pursuing policies like right-to-work, which drain unions of members and funds. Therefore while American union members are, on their own, a relatively politically active group, our unions are a comparatively weak tool for forcing concessions from the capitalist class writ large. Moreover, for all the political enthusiasm of American union members, there just aren’t very many of them compared to the rest of the population. Corporatist Iceland has a whopping 92 percent union density rate, while in the United States a meager 11 percent of workers belong to union. Iceland’s corporatism may depress the political participation of union members, but we can hardly say that comparatively higher American political participation means that workers in general are in a better place to force concessions from the capitalist class writ large. Free from the constraints of corporatism, bolstered by democracy, but crushed under the heel of capitalist class power — what are Americans to do with this information about the state of our unions? We should take advantage of the tools we have at our disposal. American union members may be a modest proportion of the population, but they’re better-positioned than their corporatist counterparts to lean into the strategies that work best. American unions haven’t always recognized that the absence of corporatism opens up new possibilities for using the strike. Indeed business unionism, a model predicated on the idea that what’s good for employers is good for workers, which has become the dominant concessionary tendency in the American labor movement, has all but eradicated the strike. As Joe Burns notes in his book Reviving the Strike, in 1952 there were 470 major work stoppages, involving 2,746,000 workers. In 2008, there were only 15 such stoppages, involving 72,000 workers. But as the nationwide teachers’ strikes this year have shown, workers themselves are realizing on their own the strategic utility and awe-inspiring potency of withholding their labor to force concessions from their employers. Union leadership in America is not tempted by any particularly advantageous quid-pro-quo arrangement to repress strikes, as unions in corporatist settings are. This is an an opportunity — if only workers would recognize it. American unions should take a cue from the teachers and learn to strike again. Furthermore, the fact that we have a relatively high degree of democracy — compared to countries like Egypt and Pinochet’s Chile — also provides an opening. As Kerrissey and Schofer’s research shows, the state’s refusal to grant labor unions a seat at the table incentivizes American unions to organize and mobilize their members to exert pressure in other ways, from demonstrations to elections. Meanwhile our civil rights and free speech protections, such as they are, mean that American workers can engage in this sort of political activity without the same fear of reprisal experienced by those in more authoritarian political contexts. Again, American unions should lean into it, and channel members’ willingness to participate politically toward building class power. In particular, the left-wing currents in the labor movement should strengthen bonds with external left-wing political currents, for instance by actively pushing for class-wide demands. On a large scale, this project is unlikely to be spearheaded by top-brass business unionists with a tacit mandate to protect employers’ profitability, and so it will likely fall to the rank and file. But all the better — because another necessary project is renewed rank-and-file engagement in unions and investment in the future of the labor movement. To that end, it’s not enough to rely on democracy in the broader culture; American unions themselves need to become more democratic, and to actively engage in the membership-oriented organizing that makes unions potentially vibrant political spaces. Relatedly, American unions must move away from a service model — in which union leaders assume that the main attraction of the union for members are the individual benefits they get in exchange for dues, and behave accordingly — and replace it with an organizing model. In the latter, members aren’t customers of the union but are the union, and the active participation of each is understood to make the union grow stronger. In corporatist countries, many unions have traded things like internal democracy and rank-and-file member engagement for a degree of legitimacy in the eyes of both the state and employers. But American unions have often made the same exchange for nothing in return. Kerrissey and Schofer’s research suggests that we have in the United States the makings of a politically robust labor movement, one that understands itself as fighting for broad working-class interests against narrow capitalist-class ones. What remains is for American unions to recognize that there is no mutually beneficial corporatist pact here. American unions have no real friends in high places. They’d better learn to draw strength from below.